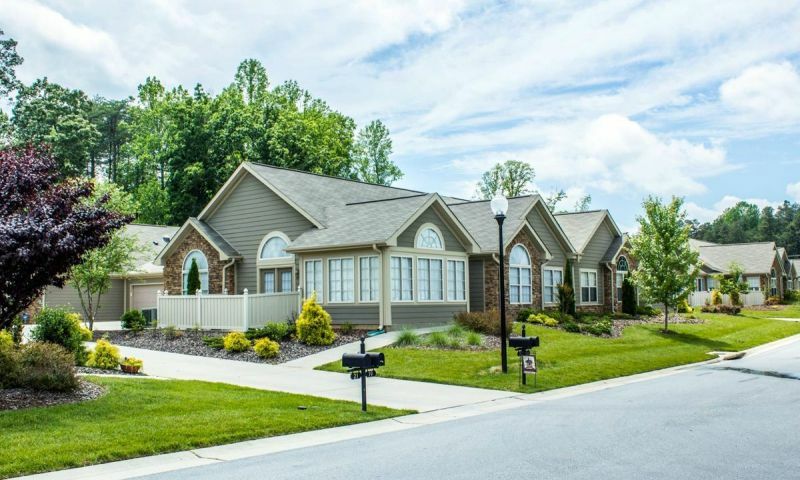 The Villas at Sedgefield is a maintenance-free community close to many popular attractions such as Grandover Resort and the Springfield Country Club. It comprises of single-story townhomes nestled among the stunning scenery of the Piedmont region. Each model is designed by Epcon with attention to detail and features versatile room arrangements and open state-of-the-art floor plans. Construction of this community began in 2005, and upon completion it is planned to contain 102 units. Until then, homebuyers can select from new inventory in addition to resale homes. Residents of the Villas at Sedgefield enjoy a private clubhouse that includes a heated outdoor swimming pool with spacious sundeck and an impressive fitness center. The social spaces of the clubhouse boast a fireplace, ample seating, a pool table and television/media area and a large community room. A spacious common area with kitchen functions as an extension of homeowners' living spaces and is used for group functions and private gatherings. Homebuyers can select a new or resale attached home within the Villas at Sedgefield. There are five ranch floor plans that have between 1,516 and 1,994 square feet of living space. Every home includes two bedrooms, two bathrooms, and at attached garage. These homes were designed for homebuyers with low-maintenance exteriors and private courtyards or patios for entertaining. Homes are heated via natural gas and forced warm air. The modern designs include luxurious amenities and elegant materials, and some of the homes feature desirable golf course views. Kitchen appliances include dishwasher, slide-in oven/range, disposal and built-in microwave. Other interior features include garden tubs, security systems and ceiling fans. The Villas at Sedgefield is more than just a collection of homes. It is a lifestyle community where all can experience the best that life has to offer among engaging amenities and friendly neighbors. Residents often plan fun activities and neighborhood events. In addition, various interest groups and clubs meet regularly. These include games nights, cards clubs, hobby groups and book discussions. Since the Villas at Sedgefield is meticulously cared for, homeowners have plenty of time to enjoy the clubhouse, exercise room, and pool as well as take advantage of the nearby entertainment and recreation options. Residents often get together to and visit theaters and restaurants throughout Greensboro as well as attend themed parties in the clubhouse. Getting to meet new neighbors is never difficult because the clubhouse hosts social events like coffee and conversation, brunch, and billiards. With its proximity to the Grandover Resort and the full-service private Sedgefield Country Club, Villas at Sedgefield provides a desirable location with views of fairways and tree-covered hills. Established in 1925, the Sedgefield Country Club hosts the Wyndham Championship. It is home to the par-70, 18-hole Donald Ross golf course where great golfers like Gary Player and Arnold Palmer have played. As the third largest city in North Carolina, Greensboro has a large variety of shops, restaurants, recreational opportunities, medical facilities and cultural destinations. Popular attractions include the Weatherspoon Art Museum, BurMil Park, the Barn Dinner Theater and the Tanger Family Bicentennial Garden. Cities within a 40 mile radius of Greensboro include Winston-Salem, Lexington, High Point and Asheboro. Homebuyers looking for a lock and leave home should look no further than Villas at Sedgefield in Guildford County, North Carolina. There are plenty of activities available in Villas at Sedgefield. Here is a sample of some of the clubs, activities and classes offered here. Homebuyers can select a new or resale attached home within Villas at Sedgefield. There are five ranch floor plans that have between 1,516 and 1,994 square feet of living space. Every home includes two bedrooms, two bathrooms, and at attached garage. These homes were designed for active adults with low-maintenance exteriors and private courtyards or patios for entertaining. We found Villas at Sedgefield to be a good value. The homes are priced right for what you get and the clubhouse is nice. 55places.com is not affiliated with the developer(s) or homeowners association of Villas at Sedgefield. The information you submit is distributed to a 55places.com Partner Agent, who is a licensed real estate agent. The information regarding Villas at Sedgefield has not been verified or approved by the developer or homeowners association. Please verify all information prior to purchasing. 55places.com is not responsible for any errors regarding the information displayed on this website.